Here's a photo I took earlier this week: a big yellow moon as it passes through a cloud, surrounded by a cold, blue winter sky. 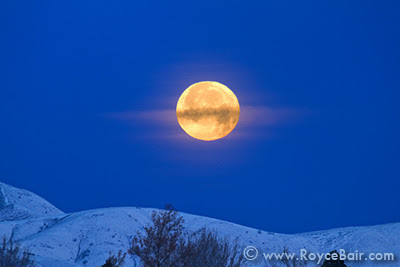 Only five minutes later the same full moon begins to set behind the Oquirrh Mountains, near Salt Lake City, Utah. 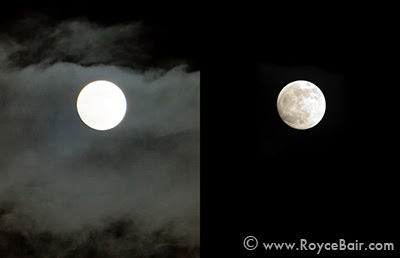 You can't have it both ways: either you get a washed out (overexposed moon) in order to see the clouds and surrounding landscape detail -- or you get a correctly exposed moon, and lose all the surrounding detail -- that is, unless you follow these "Nightscape" tips. Moon Charts: I use the Old Farmer's Almanac moon phase, rise, and set charts to plan my shoots. (All times are based on sea level, so they must be adjusted slightly for mountainous terrain -- the moon will set sooner because of mountains, and the sunrise will be delayed because of mountains, and etc.) Using these charts, I can often get at least one moon rise and one moon set per month (weather permitting) that allow for good, full moon photography. 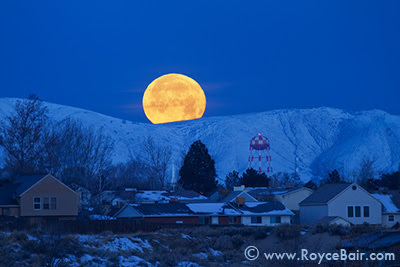 An example of how I did it: Based on my Zip Code, the full moon was to take place on January 9, 2012 at 12:32 AM. The sun was suppose to rise on this day at 7:51 AM, and the moon was scheduled to set at 7:54 AM. Because the eastern mountains around Salt Lake City are about 6,000 feet higher than the valley floor, I figured (by experience) the sunrise would be delayed about 30 minutes. And because the western mountains are about 3,000 feet higher than the valley floor, I estimated the moon would set about 15 minutes early. I figured right on both accounts. This photo was taken at 7:30 AM, with just enough predawn twilight behind me to add detail to the western sky (change it from black to a dark blue) and western mountains. You can also view my "Most Interesting" images on Flickr to see more of "My Vision". Royce, Thanks for sharing all this great information! Awesome tips! 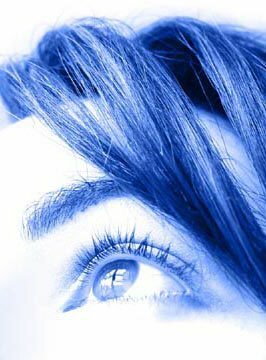 I just found your work--great photography! I, too, like to shoot nightscapes and I noticed that several times in your explanations you've mentioned using the Farmer's Almanac. Have you tried any ephemeris programs? They are available for all the platforms (PC, Android phones, iPhones, etc.) and are extremely useful. Not only do they provide sunset/rise and moonset/rise times, but they also show you graphically where they occur on a map. You can "scroll" backwards and forwards in time to find when and where they will line up with a landscape feature.